I reread this classic work on a Kindle version. 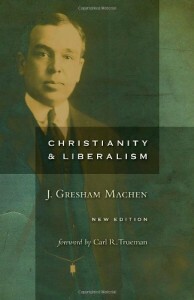 Machen first wrote this book in 1921 when his Presbyterian church was experiencing encroaching liberalism. It was first published in The Princeton Theological Review and was later put in book form. The book simply moves through the subjects of man, sin, God, Scripture, Salvation, and the Church, in each way showing how Liberalism is not Christianity as much as liberals try to make it so. Machen’s logical reasoning and clear use of Scripture has ever since made historic Christianity clear and plain. Machen writes, “Faith is being exalted so high today that men are being satisfied with any kind of faith, just so it is faith. It makes no difference what is believed, we are told, just so the blessed attitude of faith is there. The undogmatic faith, it is said, is better than the dogmatic, because it is purer faith—faith less weakened by the alloy of knowledge.” He also wrote, “The greatest menace to the Christian Church today comes not from the enemies outside, but from the enemies within; it comes from the presence within the Church of a type of faith and practice that is anti-Christian to the core.” These and others show why a second or third reading of this book is always worthwhile.